Read and Share: Look, I'm Reading! 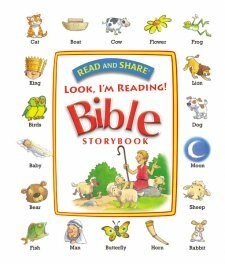 Bible Storybook is a perfect book for beginners. Young readers find joy in being able to 'read' with the help of images. I am not opposed to this concept. It builds confidence and gives them the courage to read a book that might otherwise seem intimidating. Some schools of thought frown completely on this style of teaching. They suggest giving the child no colors, no images, no hints and have them memorize phonetics first, before even attempting to read a phrase, sentence or a book. I disagree. I am a strong believer in immersion. I immerse my children in books, usually way above their reading level. By doing this, they are exposed to challenging vocabulary at a young age. With books like this, I encourage them to read as much as they can and then I help with the more difficult words. The pictures placed sporadically throughout the page help immensely because even though they might struggle through a few hard words, they can breathe a sigh of relief when they can figure out the picture words, and know that they got those words right. The book is divided into different sections from both the Old and New Testament based on certain Bible events and characters. For example, The Flood, Abraham's Family, Jesus' Life, Saul Becomes Paul, to name a few. Within these sections are several stories which include a sweet cartoon image with the Biblical reference to the story. The opposite page is a short, one-page version of the story with three different images scattered throughout. For example, in the story of David and Goliath, the images were Goliath, stones and slingshot. My daughter loved reading through these stories, images and all! This book is packed with more than 90 Bible stories and would make an excellent gift for a young reader! Disclaimer: Thanks to Book Look Bloggers for providing this book for review. All opinions expressed here are my own.